Italy's best known drinks might be wine and forgettable Euro-lagers, but to the surprise of many it has now become one of the hottest markets for craft beers, and yes, even real ales. So in the week that London's first Italian craft beer bar has opened – almost inevitably named The Italian Job – here's an interview with that country's top brewers, Pietro Di Pilato of Brewfist, based not far from Milan. We met last month at Brewfist's tap take-over at the Three Johns in Islington. A dozen of Pietro's beers – including collaboration brews with the likes of De Molen, Beer Here and To Øl – were on keg and the place was buzzing. Brewfist is not well known on the British market, but has been growing fast in other countries. Pietro said that its number one export market is the US, followed by Japan and Scandinavia (the craft beer market in the Nordic countries has exploded in recent years), but with Russia growing fast and bidding for the number two spot. “In 2015 we want to break into Brazil and Canada, those are two countries we're missing,” he added. His range is broad – “20 beers in regular production, and every year we add three or four.” They run from Stouts to Saisons via the odd Imperial Pils, although like most craft brewers he also does quite a few in the American Pale Ale and IPA mould. “Italian people said 'IPA is just a fashion' – it's not just a fashion,” he declared. Interestingly, he added that Saisons are very popular in Italy. One of the challenges of doing so many different brews is that you may end up having beer in storage for a while. Pietro said that's why Brewfist recently invested in a new refrigerated warehouse with a capacity of over 400 pallets. They are also getting a centrifuge so they can remove yeast without needing to filter: “The Italian market expects clear beer,” he said. 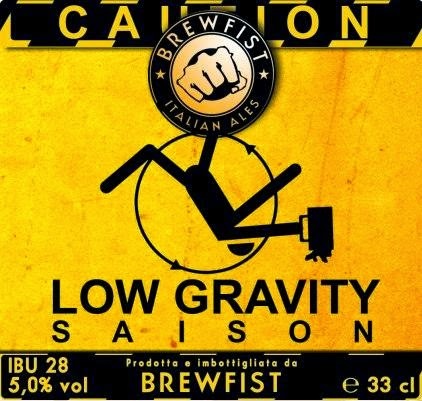 Brewfist now produces some 6000 hectolitres a year on a 20 barrel (32 hl) kit, which is pretty big by Italian standards. For example, Pietro estimated that in two weeks he produces about as much beer as Loverbeer [another very highly regarded Italian craft brewery] brews in an entire year. Another problem I've noticed with Italian craft beer is excessive pricing, and Pietro confirmed that too (as did the price list at the Three Johns!). He said it is partly the very high cost of running a company – any company – in Italy, to the extent that people can import craft beer from America and sell it cheaper than a locally made brew. “Italy is the worse country in Western Europe for doing business,” he said. “There's around 65% tax on business when everything's included.” But it seems it's also a business decision by some of the other brewers, who have gone for expensive packaging and so on in order to compete with wine. 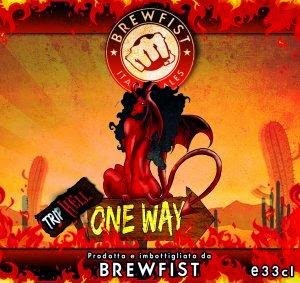 Thankfully, that expensive – and probably largely futile – route is not one that Brewfist is following. The beers on tap that night were almost all very good, and some were quite excellent. Particular stand-outs were two of the stronger ales: Spaghetti Western was an 8.7% roasty and dry Imperial Stout that's a collaboration with US brewer Prairie Artisan Ales, while One Way TripHell was Pietro's 9.5% take on a Belgian Tripel that expertly blended the sweetness of an abbey beer with the dry spiciness of something like a strong Pils. So, tasty beer out of Italy! I think this means I had better get myself over to The Italian Job soon and find out more – especially as it's only a couple of miles away in Chiswick. What does 'local' mean to you?